Trying to manage a start-up or growing business is a lot of work. Customer relations, marketing, sales and website management are only some of the different aspects of your business that you’ll have to juggle. Let’s be honest here – it’s easy to lose focus. It’s even easier to be really busy every day without getting much done by the end of the day. Luckily there are tools available that help you organise these different functions and even automate certain tasks to take some of the strain out of running your business. You could spend hours searching the internet for best tools for small businesses – or you could just take a look at the following list of online business tools that our team at TextMagic uses to help us grow our company. 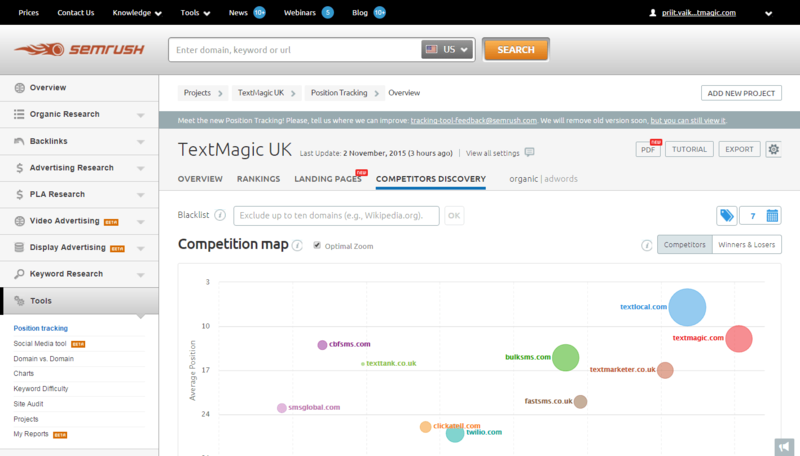 At TextMagic we simply love Geckoboard! Every team at TextMagic has its own Geckoboard and we check it on a daily basis. We believe that setting goals and attaching real metrics to them is a great way to track the growth of your business. We use the data dashboard from Geckoboard to measure our progress against our key performance indicators (KPIs). Geckoboard gives us the ability to set metrics and track them all within a central location. We can see the goals we have set and how far from or close we are to achieving them. It creates transparency in the company culture and helps the team members to stay focused. If your company is experimenting with different marketing strategies or juggling multiple projects, or if you just want a way to track day-to-day operations like sales and customer support, then you’ll want to give Geckoboard a try. If you’re a company that does its business online, you’re probably interested in attracting more visitors to your website. Achieving that doesn’t happen overnight. You need to offer something to your potential clients that actually has meaning to them. How do you do that? 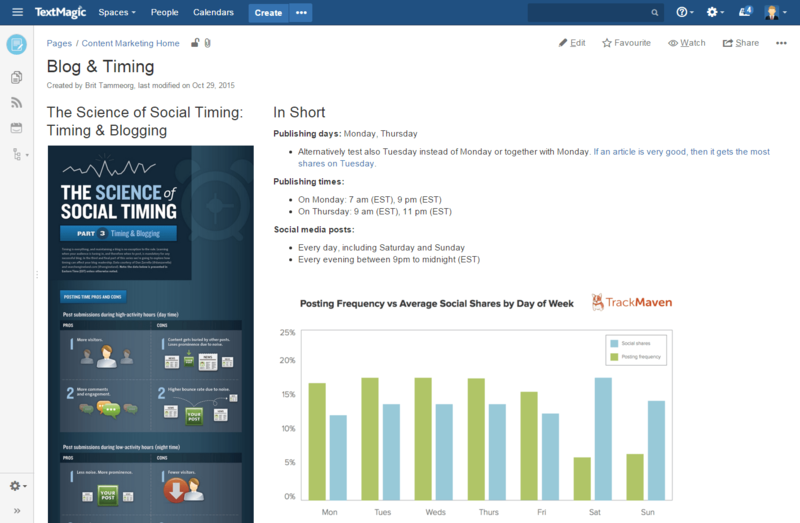 Our marketing team uses BuzzSumo to find interesting content for our TextMagic Blog. Once we’ve published the content, we use BuzzSumo to see if that content appeals to our audience. Not only is it a great analytics tool, but it gives you the opportunity to look into what your competitors are doing. You can simply paste your competitor’s website address into the BuzzSumo search and it will tell you which page has been the most popular. At the content end, BuzzSumo also helps us find keywords and content related to our industry that have been shared on social media. This is important if you’re running a company blog or doing any type of content marketing, because you’ll be able to see what type of content your target audience enjoys the most. Whether you’re a small, medium or large company, search engine optimisation (SEO) is crucial for your online marketing strategy. You’re competing not only with your competitors, but also with all sorts of information that’s available online. Imagine this scenario. A potential customer is in need of the service you provide: a tool that helps him send mass text messages to his clients. In order to find you, he types “mass text message” into a search engine. Surprise, surprise: the search returns more than 40 million results. Finding you is like finding a needle in a haystack. Having all of this information allows us to put together a solid strategy for search engine marketing. Ahrefs is hands down the top tool to find out what sites are linking to you, as well as your competitors. It can be a bit slow at times, but the results speak for themselves. Our SEO team consults it on a daily basis. It’s simple to use, so if you want to know how your site is performing but aren’t an SEO expert, Ahrefs is the tool for you. 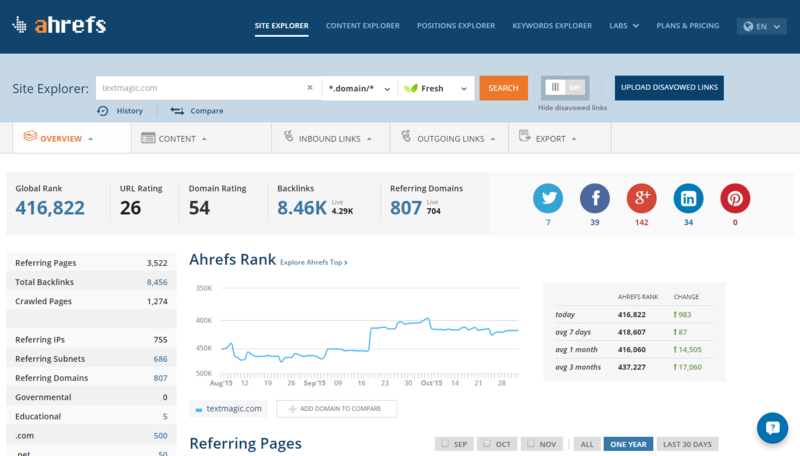 In addition to monitoring your backlinks, Ahrefs lets you track your search rankings, find highly shared content (similar to BuzzSumo) and discover new keywords to target. Mailgun is a relatively easy-to-use transactional email service. Transactional emails are emails that are sent once an action or transaction has been completed. For instance, when our customers are low on credit, they receive a notification email from us. The transaction (low credit balance) triggers the email to be sent automatically. We use Mailgun because it allows us to do in-depth A/B testing and get detailed analytics. So we know how many of our emails are opened and whether people are clicking on the links in the email. The most important thing, though, is that Mailgun is easy to integrate and has a high delivery rate. We use Sendwithus together with Mailgun. If you want to send out transactional emails but don’t want to deal with a lot of code, then combining Mailgun with Sendwithus is an ideal solution. You can even integrate the two with Zapier to make the process even smoother. Sendwithus allows you to create email templates. For instance, if you have an email that you send out whenever someone leaves a comment on your company blog, you could create a template for those specific emails and automate the process. Of course, we don’t automate everything, because we believe in and see the benefit of having real interactions with our customers. But if you’re a small team and plan to stay small, automation is inevitable. Occasionally we send out emails or newsletters to our customers to ask what they think of our new features or to make an announcement. Thanks to Vero we can send out simple, targeted messages at the right time, every time. Let me give an example to illustrate my point. A week ago we launched our blog. We worked on it for months to provide high-quality content that is interesting and useful for small companies around the world. It’s unreasonable to expect that our customers spend their time browsing our website and will therefore notice the blog. We used Vero to create a simple email and scheduled it so that our customers around the world would receive the email on Thursday morning their time. No one wants to receive an email at the end of the workday, when they just want to go home to their family, or first thing on a Monday morning. So far we’ve seen great open rates for scheduled emails! As your team starts to grow, you’ll need a project management tool of some sort. Working in different companies, I’ve seen both chaos and order when it comes to finding information. Which do you think helps the company to grow? It’s not hard to guess that when everyone in your team knows where the information is, it saves time. We use the suite of Atlassian products, including HipChat, Jira and Confluence, so our entire team can collaborate on various projects. Whether it’s messaging, coding or any other project involving multiple people, Atlassian will keep you organised! For example, you can use Confluence to create your company’s Wiki page. Our product, marketing and support teams each have their pages where you can find statistics, important articles and information about the latest projects, as well as the company strategy and vision for the upcoming years. I once heard that one young tech-savvy father had a Confluence page to help him keep up with family plans and events. In our opinion, it’s essential to have one place where all your company information is together and which is easy to use and accessible over the cloud. Customer support has an important place at TextMagic. We care about having a customer support system that fits our needs, because only then can we be sure we hear all our customers and are there for them. To provide the best customer support we can, we use Desk, which has a great ticketing system. 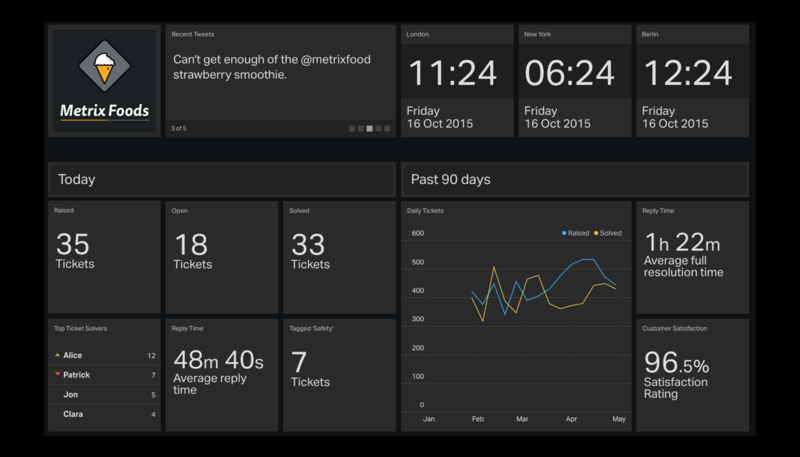 It has a user-friendly dashboard and gives us insight into how effective our support team is. Best of all, it’s an affordable option for start-ups and small businesses. Trying to explain what you’re seeing on your computer screen to your co-workers over email can be difficult. It’s inefficient and leaves a lot of room for miscommunication. To avoid that, we use Snagit. Snagit is great for taking screen captures and video recordings. You can even use them for creating tutorials or add them as visuals to your blog posts. If there’s one thing that steers users away from an app or website, it’s unexpected crashes. We don’t want it to happen and I’m sure you don’t either. Perhaps you’ve heard about Bugsnag. It’s an error-monitoring tool that will alert you to bugs and crashes within your applications so you can fix them quickly and avoid losing users. Bugsnag doesn’t just let us know when our users experience problems, but also helps us discover why.